(Author’s note: This article was written in 1985 for Indian Time, a weekly newspaper of the Mohawk Nation, to help spread interest in these early tracking camps. Having returned to the United States in 1984, after spending 7 years in Australia, I was teaching at Tom Brown’s Tracking School and doing workshops all around the country, sharing a blend of Australian skills mixed with the Tom Brown style. So, the opportunity to work with Ray Fadden and the Mohawk youth at the Six Nations Indian Museum helped me see the value of these skills in the hands of the Native youth and to create a format for The Tracking Project’s Native youth camps here on Turtle Island which have continued from 1985 to the present. Dave Fadden. 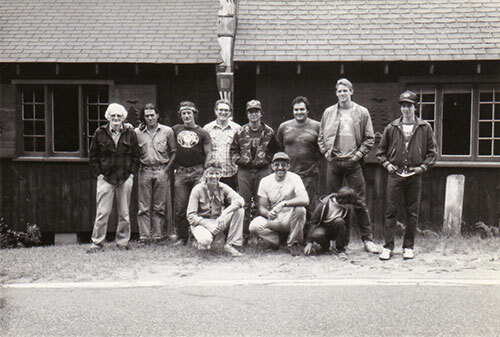 (Front row): Roy Hurd (Poncho), Joe Bruchac, Danny Fadden. For two days in July, August and again last weekend, a small group of people from the Akwesasne community and the Adirondacks have met at the Six Nations Museum in Onchiota to learn tracking and wilderness skills. Learning to read the approach of a fox from a bluejay’s alarm call, to track an animal to water, to twist plant fibers into rope, or to stalk a deer across an open field are not skills that one picks up overnight. They require patience and lots of practice. But in time these old ways return and with the comes a deep respect for the people who practiced these ways in the past. Using the museum and the stories of Ray Fadden as a resource, the classes have included firemaking, shelter building, water collection, hunting techniques, gathering edible plants, camouflage and stalking, track identification, cordage making from plants, bowl burning and boneworking and different exercises designed to increase awareness of the natural world. Between talks on these survival skills, the group goes to the museum where Tehanetorens reads the beaded belts on the walls and explains the philosophy behind the ways of Indian people. During the 1940’s and 1950’s, Tehanetorens ran the Akwesasne Mohawk Counselors Organization, teaching these same skills and stories to young people, many of whom now hold strong positions in the community. The present classes are a continuation of the work he began fifty years ago. The class list includes: Ray Fadden, John Fadden and sons David and Danny, Peter Blue Cloud, Danny Thompson, Andy Benedict, Joe and Jim Bruchac, Roy Hurd (Poncho), Jason and Adrian McDonald, Jerry Lauzon, Rick Sauers, Cori Charters, Layne Redmond, Steve Burda and John Stokes with visits from Ed and Joyce Benedict of Cold Brook, Steve Fadden and the LaFrances and the support of Christina and Eva Fadden. Waking to the howls of ravens and the smell of strong coffee and pine smoke, each day has been filled with lessons, stories, work around the camp and lots of music. By night, sitting around the fire, listening to stories or burning bowls and spoons, making jokes, learning to move silently through the woods in the dark. John Stokes, who teaches the classes with Tehanetorens,, learned wilderness skills first with the Aboriginal Australians of South Australia and the Central desert, and then with Tom Brown’s Tracking and Wilderness Awareness School in New Jersey. After doing a demonstration of these skills at the Native Self Sufficiency Center in Cold Brook in 1981, he maintained contact with various people from the Akwesasne Community and was invited to teach at Onchiota. The skills being taught are not so much ‘Indian skills’ as ‘earth skills,’ the skills that any human on the planet needs to survive. Tracking is nothing more than becoming aware of everything that moves around us and how we are connected to it. When something in the forest moves, it affects us and when we move, we affect everything else. So much of the destruction of the natural world takes place because we are not paying attention to the earth, not taking the time to appreciate what is going by us. Tracking places us back in the web. In the future, classes will begin to renovate exhibits outside at the museum, look at the effects of acid rain on the foliage, learn more of the ways of the animals living around Onchiota — the bears, squirrels, birds, hawks, eagles, coyotes, chipmunks, porcupines— and learn more of how humans can fit back into the natural patterns. We look forward to having more people from the community join us. For more information contact: John Fadden, Six Nations Indian Museum, Onchiota, NY 12968 or call (518) 891-2299.